Read all about it: Louisa May Alcott touches off a firestorm of controversy over the Pennsylvania banknote. Well, not really, but it is interesting that featuring her on the banknote from Pennsylvania has created some interesting discussions about whether she should have been the artist’s choice considering that although born in PA, she moved (with her family) to Massachusetts at the age of 8. When I wrote my first blog last week on the people featured on the new US State banknotes I never realized the interest and debate it would generate (especially from people much more cleverer than what I am – not hard though as you can see). I must admit, without upsetting the amazing artist Tom Stebbins, whom I respect for his choice and reasons there-of, I do agree with some of the comments and the alternatives that were offered, which I have listed below with the permission of the commentors. Of course, this is out of my hands, but I would still love to see what others think and of course, it may FUN (this is a FUN note remember) to get votes on this to see who most people think should be on the note. I will forward your responses to Tom in case he decides to do a second series. I will see if we can set this up somehow (I use the royal we here – no not the royal we – as I mean Nate). Who would you vote for to be depicted on the Pennsylvania note? Post a comment. Anyway, who would have thought that Ms. Alcott would be such a controversial figure and I do appreciate the comments and I will start the voting if that is OK and say I will go for Ben Franklin, but William Penn is a close second in my book. I suggested this to Tom, but he was concerned with running afoul of the Federal Reserve considering that Mr. Franklin is on the $100 US banknote, not that I have ever seen one of those. I just got off the phone with my niece from Pennsylvania, she is an elementary school history teacher. She was upset with Tom Stebbins’ choice of Luisa May Alcott to represent Pennsylvania. Louisa May Alcott is not considered to be a Pennsylvanian by historians. She suggested John Updike or Benjamin Franklin as viable representatives. Note at bottom of email: On the other hand my sister would like a Pennsylvania banknote because it antagonizes her daughter. (LOL) She thinks that the PA banknote will become the most valuable note in the set because it is an anomaly. 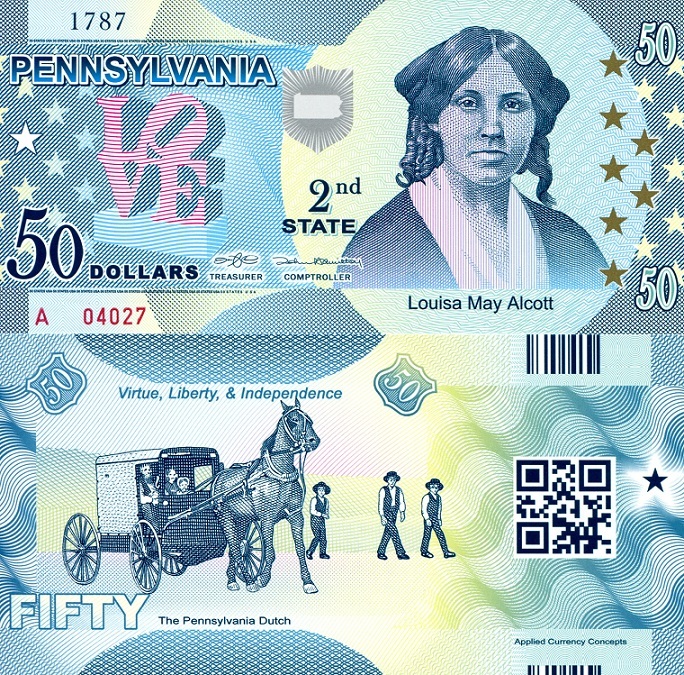 I am surprised by the choice of Louisa M. Alcott on the PA State note. I appreciate her legacy to literature, but is she really representative of PA? The photo of Louisa May Alcott on the front of the bill is puzzling. Whereas many historical figures such as Benjamin Franklin, William Penn and Betsy Ross are immediately recognizable as being from Pennsylvania. Miss Alcott is not at all considered to be a Pennsylvanian. One of my lawyer friends was actually offended at Tom’s choice. I don’t know the feasibility of changing the front portrait at this point in time but my feedback from my PA friends was unanimous, they agreed that the Amish (Pa Dutch) rendition on the back of the bill was excellent but Louisa May has got to go. Who decides the people features on these notes? I am sure there is reason for using Louisa Alcott, but feel that there are other people much more representative of PA, and as she moved at such a young age (your blog said 8) the book she is famous for was, as such, penned in MA, not in Pennsylvania. Pennsylvania has Ben Franklin who was one of the most important literary figures because he used a printing press to publish Little Richard’s Almanac the first published piece of literature in US History. He is also very representative of Pennsylvania. My friends are livid that you chose Louisa May Alcott not because they are gender biased or racists it is because Luisa May Alcott is not representative of Pennsylvania. Good to see a woman on a banknote, but did anyone think of Betsy Ross for PA? NB: I have some nice comments on this note too – especially the depiction featured on the back.